As introduced in the 2018 Halloween ComicFest sampler! From acclaimed mangaka Tsutomu Nihei, the creator and artist behind BLAME! and Knights of Sidonia, comes his newest science-fiction epic. The 200,000 kilometer diameter artificial celestial body of APOSIMZ. Most of its volume is its core space, which is covered by a superstructural shell. 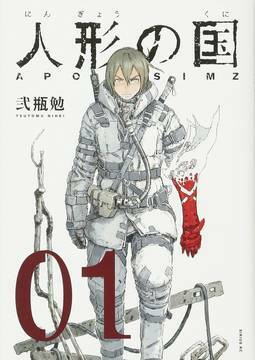 Fifty centuries ago, the people who lost a war against the core lost their right to reside legitimately in APOSIMZ, and were left behind on the extremely cold surface. They face the spreading Frame disease. And aggressive automatons which appear frequently on the ruins level. Yet even so, somehow people survive..